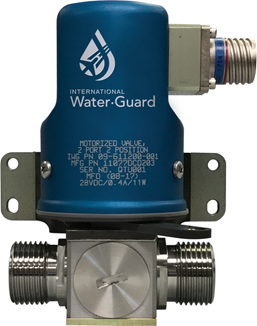 International Water-Guard Industries Inc. (IWG) as the world leader in onboard UV potable water treatment and water protection on aircraft continues introducing innovative water system solutions to the industry. IWG “Featherweight” (FW) Motor Operated Valve series. It is based on a robust design that has over 20,000 units in service today in business jet water systems. The FW valves are a lighter weight derivative of the in-service valve achieved by redesigning the actuator housing assembly into a single part. IWG is offering the FW valves at competitive prices with industry best lead-times. View the IWG-FW MOV Unit.Contact us directly to learn more.